Moving ahead in his quest to know the real India and its root, Pandit Nehru visits the great epic of Mahabharata. 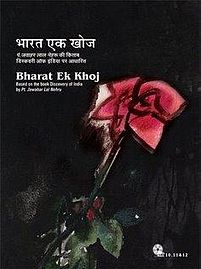 This epic is explored in the Hindi TV serial Bharat Ek Khoj (based on Pt. Nehru’s book) in two episodes. Mahabharat (aka Mahabharata) is the longest epic of the world. It is said that there is no situation or problem exist which is not mentioned in this epic. The most comprehensive book of wisdom – Shrimad Bhagvad Gita – is a part of this great epic. The original name of the epic is – Jaya (aka Jay). It is the journey of one’s victory over himself, his own weaknesses, learn wisdom and know the truth of life, before and after; and yes, the Karma and the destiny. The first episode of this TV serial, doesn’t go ahead with the traditional way the Mahabharat is explored by the other creators. It introduces to a folklore singer named Tijanbai who was famous for performing the incidents of Mahabharat in her unique way on the stage. Tijanbai’s performance belongs to the Pandvani folk lore segment or tradition. During her performance she narrates (not in pure Hindi) the incidents with the on stage musicians and others. And, when visiting the folk version of any epic, you will get to know the incidents in the manner the people belong to that tradition used to like it. Some subplots and sub stories are also get added during such dramatized representation. Though, it is worth to note that Mahabharat is like a banyan tree which is full of sub plots, stories and incidents life its branches and leafs (in other words, Mahabharat itself is a compendium of a lot of stuffs). In Tijanbai’s performance – the birth of 100 sons and 1 daughter of Dhrutrashtra (technically proper word is Dhartrashtra – famous as Kauravas), and the birth of 5 sons of Pandu – are the incidents explored. Mahabharat is the rarest of the rare creation which last its impression so long on the common people since centuries. Also if you explore the Mahabharat with a scholar’s point of view, you see the interaction of the people from different social and geographical segments with each others. The incidents like Ganga and SatyaVati’s marriage with Shantanu, or Hidimba’s marriage with Bheem, or several marriages of Arjun or Uttara’s marriage with Abhimanyu you got to know a lot of stuff about the social formation those times. There were no cast/geographical boundaries making hurdles to marriage when the participants are happy, those days. Even the wars were fought for and stopped on due to some marriages. None of the social segment was unimportant. Even getting a child from someone other than the husband was executed when needed. So the society was broad minded and open for new views and ways, those days. Mahabharat also explores how an ambition can be resulted into havoc (if remain uncontrolled by wit and wisdom). It also raises questions about whether the kingship should be granted based on the family lineage or skills should take priority. This episode also explores the famous gamble between the Pandavas and the Kauravas. Shakuni, the brother of Gandhari, was playing dice from Kaurava’s side. This is gamble which was the final reason for the war. In this gamble Yudhisthir (the eldest Pandava brother) lost everything, including his property, kingdom, brothers and even their wife Draupadi. Duryodhan and Dushashan tried defame Draupadi in public by removing her cloths in an unsuccessful attempt. It resulted into a very long, time of isolation from the kingdom and the society for the Pandava family. The episode also explores the final attempt of Lord Krishna to represent Pandava and their side in the court of Hastinapur. He attempted a messenger of peace. The attempt was a failure as predicted and it lead to the final war. It was not just a war, it was the biggest battle the mankind had ever seen in the ages. The content is explored in the episode from the book’s point of view and you will see that the stuff is shown in “no larger than the life” manner, which is its positive point. It also discusses various progressive versions of this great epic. The other positive point is the acting of the principal cast, which stands out. The DVD quality is good and it provides you a way to look at the heritage in a different yet convincing manner. Our verdict is, one should go for it.